Are you running an HTML5 browser? with WebGL? Please follow this link before trying any of the HTML5 scripts: http://phillihp.com/projects/html5-and-webgl/. There will be a link back to here once completed. Play WebGL Tetris here: http://phillihp.com/projects/html5-and-webgl/creating-tetris-with-opengl-and-webgl/tetris-v1/ (You need an HTML5 browser). I use well known games and applications as an assistant to learn and explore new technologies and programming languages. 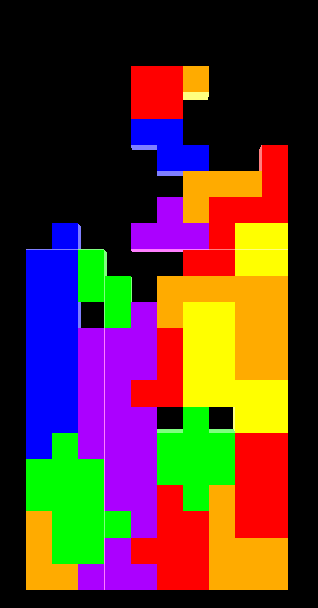 For HTML5 and WebGL, I’ve chosen to do Tetris. So far, I’ve created Tetris twice, once my freshman year of college in JAVA, and again my Junior year in OpenGL and C++. The previous OpenGL has really helped out, it all came right back to me. I’m debating whether or not to make this Open Source and to build a tutorial on how to build the game. If I can get my Kinect project up and configure gestures to keyboard commands, I should be able to allow this game to be controlled via Kinect. It’s important to know how the Tetris objects are setup. For this, I simply created a spreadsheet. I’m using all of the original colors. Some good updates out of this one. New background color, integrated with the template, the game ends, and more. I’ve got many of the major pieces working now. I still need to implement many features. Here’s a current screen shot. Now, mind you, this is all in 3D. As soon as I say to rotate the entire graphics, you can see the 3D faces show up. You can see minor alternate faces with those lines, and eventually, I’ll have textures added. I was able to quickly test this using Firefox Fennec on my Android, which is Firefox’s mobile WebGL distribution, and sure enough, got my Tetris to show up there too. Pretty wild! I’m working out the kinks at the moment. My code works on my Dell Laptop and my Mac, but my Asus netbook is having trouble. I have yet to even venture into the Firefox space. That’s why we do this, right? Feel free to leave comments with your specs so I can get this completely cross-browser compatible. I was reading something else about this on another blog. Interesting. Your linear perspective on it is diametrically contradicted to what I read in the first place. I am still reflecting over the various points of view, but I’m leaning to a great extent toward yours. And irrespective, that’s what is so super about modern democracy and the marketplace of thoughts online. That is good that people are able to receive the business loans and this opens new opportunities. When you are new in social bookmarks submission, you will ought to search for the social bookmarking submissions service. This is really great! It’s great to make 3D stuffs! Wow! That is so great! Tetris software is amazing. I’m really used in playing Tetris on Facebook. There’s also a feature there wherein you can play against another player coming from other walks of the world. Though I’m no longer a kid and already married, I still do love Tetris. As soon as I find some free time (ha!!) I’d like to implement a node.js backend that would allow multiplayer. Great post. Keep it rolling. One of the things that I liked the most about the Tetris project is how you did lay-out the Tetris objects by position and object – that made it a ot easier for me to think the entire project through. I review fishfinders like the c120 raymarine, but I also like programming some games, using C++. Great post! Keeping a fresh blog is hard and quite tiresome. You’ve pulled it off well though.